Whenever one of your teeth has become damaged due to decay or injury, the structure needs to be repaired in order to keep the tooth viable. This will enable you to use the tooth without it breaking further. It can also serve as pain relief, as often times the damaged portion can affect the tooth’s delicate nerve. If this damage is slight or the decay has been caught early, the best solution may be a tooth-colored filling from Dr. Goodman, your dentist in Columbia, TN. This is why most patients and dentist choose to use tooth-colored fillings when making minor repairs to teeth. The procedure to get tooth-colored fillings in Columbia, TN at Goodman Family Dentistry is very straightforward and painless. You may require a bit of local anesthetic if a portion of a decayed tooth needs to be removed first. Once the tooth is ready, Dr. Goodman will apply a primer (a weak acid) to it. This will etch the tooth and provide a better, rougher surface for the resin to bond to. This is when the actual filling material will be applied to the inside of the tooth, restoring the missing structure. The material will then be sculpted to better fit into your tooth, and then a curing light will be used to harden it. After it has properly hardened, Dr. Goodman will check to see how your teeth fit together and make any adjustments if necessary. Are They the Best Choice For Me? 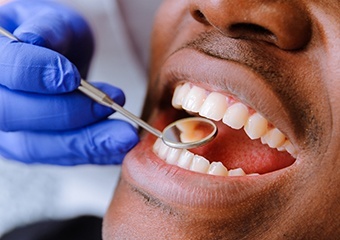 When it comes to repairing your teeth, consulting with your dentist is key. Dr. Goodman will be able to assess your personal situation and determine if tooth-colored feelings are the past path for you. If you are curious about tooth-colored fillings and what they could do for you, please give us a call today.